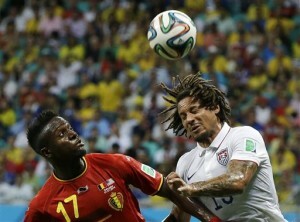 The U.S. was knocked out of the World Cup on Tuesday by Belgium 2-1 in extra time. However, there were plenty of signs that good things are on the horizon for the Americans. Veteran goalkeeper Tim Howard made 16 saves, some of them in spectacular fashion but to no avail. However, it was the young guns, which impressed the most. The future was the word when United States National team coach Jurgen Klinsmann named his roster for the World Cup. There were questions raised about the youngsters named to the team. DeAndre Yedlin, John Brooks and Julian Green were named and many felt Klinsmann was bypassing the opportunity to win today in exchange for building for tomorrow. The play of the youngsters mixed with a number of veterans during the World Cup has validated the roster gambles made by Klinsmann and reaffirmed his vision for the next World Cup and beyond. Yedlin, a defender who is just 20 years of age, played in two matches prior to being named on this year’s World Cup roster. The young players chosen bonded quickly during the three friendlies they played in warm up to the World Cup. Against Belgium on Tuesday, the U.S. lost Fabian Johnson its best fullback early in the first half with a hamstring injury. Yedlin entered the match and was battling one of Europe’s best young talents Eden Hazard and holding his own. Yedlin has great speed, strength and will not back down. Green entered Tuesday’s match during extra time. The 19-year old had never played a single minute in the World Cup until that time. In the 107th minute, Green took a chip from midfielder Michael Bradley and volleyed it past the Belgium goalkeeper to narrow Belgium’s lead to 2-1. Green is a German American who is on the second team of Bayern Munich. He became the youngest American to ever score a goal at the World Cup. Green is a dual citizen but decided to play for the U.S. prior to the World Cup. Brooks has only four matches with the national team and was a surprise addition on the roster. In the opening match of the Cup, he scored the team’s winning goal in the 86th minute with a beautiful header.